I'm reviewing 2 books today because I'm backlogged and they are both pretty great books with a couple things in common. They each have step by step diagrams for folding flowers. One is a kit with instructions for more traditional, stylized flowers including some modular designs. 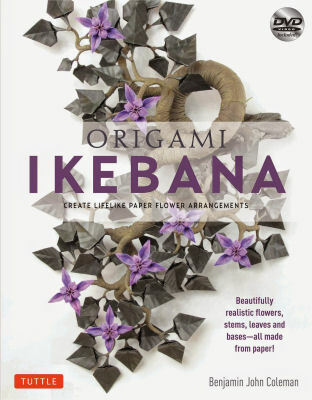 The other is a book with lots of instructions for making fairly realistic flowers and stems to create paper/origami ikebana. Both books come with dvd instruction! Books provided by Tuttle Publishing- check them out on Facebook!! This kit has paper, a dvd and a book full of traditional style flowers. The paper is a standard kami paper, brightly colored on one side, smooth, thin, and easy to fold. The book diagrams are in standard origami notation, but have instructions in English under each step to clarify the steps. The dvd is very well done, with the focus on the folding and brightly lit. The models are a mix of fairly simple one page models like the lily, more complex models like a rose, and modular models. There are also a few leaf models and instructions for adding calyxes and stems to the flowers for displays or gifts. I'm rose impaired, and A Rose for Irene is a lovely, complex model with a lot of layers. Trying it just from the book, I messed up a couple steps. So I tried the dvd. Just delightful. Each step was explained, and using it in conjunction with the book, it all made sense. It was like having a private class in how to fold that rose. I tried a few other models using the book and dvd together and it helped out considerably for fitting in the last piece of a modular flower. The lily model, as shown on the DVD actually showed me a faster way to fold it than I've been doing for the last several years. If you're more than a casual folder- this kit may be too basic for you but I'd strongly recommend it to beginning folders. The video instructions are well explained, and in conjunction with the book will teach you how to do origami. The models are well chosen too. The flowers can be use as ornaments or gifts. Ikebana is the art of flower arranging. Japanese flower arrangements are based on form, Instead of a bouquet of bright flowers all together, it's an elegant, minimalist arrangement based on a triangle of elements that draw the eye to the shape, form and feeling. It's a lot like sculpture with flowers. This book and video teach you how to create more realistic flower form to use in your long lasting paper arrangements. Everything in the arrangements is made with paper. This method doesn't use floral wire or tape. You'll need different kinds of paper, glue and paint. It's a very comprehensive book. He covers materials, how to choose and cut paper, how to find the grain of the paper and how to paint it. The models themselves are based around some common shapes and forms with enough difference to make different kinds of flowers and leaves. The flowers have enough layers to handle a fair amount of sculpting. The branches and stems are done using makigami, which is a rolled paper form that's really pretty simple once you've gotten the hang of it. That uses newspaper instead of more expensive paper, and a solution that's inexpensive to make so you can practice until you have the technique down. There are even instructions for making a rock base from newspaper for your arrangements! The video is very well done. The author is clearly enthused, and some parts he explains while looking into the camera and there are displays of ikebana hanging on the wall behind him so you can see the forms. For the folds, it's focused in on his hands and the paper. Some of the folding is more complex, but easy to understand when you see it done. So here's the part that made me really happy with this video- my family watched it with me. Not just "in the room while I watched" but actually watched it. We are all at different levels of folding ability, so parts that I grasped quickly needed to be paused and played again for some of them, but that could be done. These are projects that my whole family can enjoy. 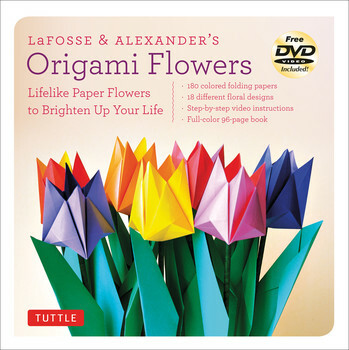 Because of the complexity of some of the flowers, I'd recommend this to people who have some experience with origami and are comfortable with the traditional, simple models. Advanced beginners will find it inspiring and probably get hooked on it. Such interesting reviews, Shala! I love that your family watched the Ikebana dvd together and totally agree with you that seeing a person do origami makes the process so much easier than just reading text directions and looking at step-by-step photos.